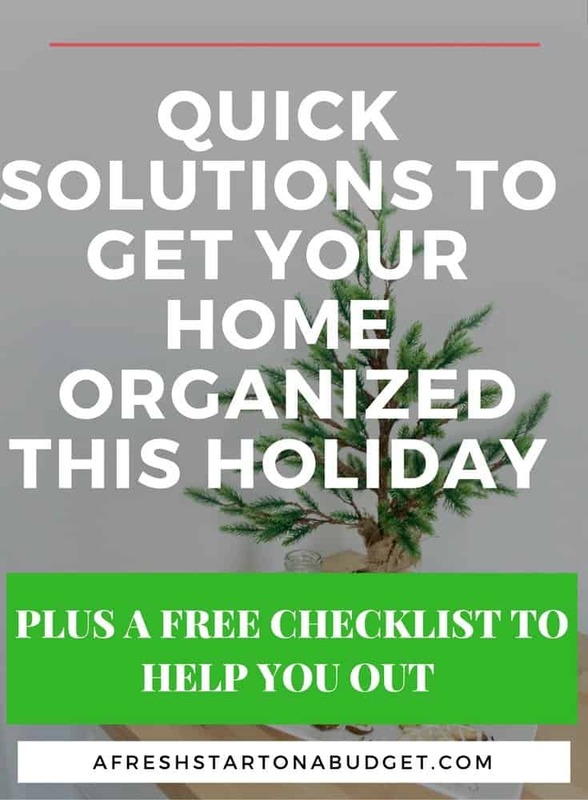 The Holidays are basically here and I wanted to give you some quick solutions to get you organized this holiday. That way you can enjoy the time with your family and friends. Without the stress of a messy home and feeling like you need to clean and organize when you should be celebrating. Getting rid of clutter and things you don’t need will make a huge impact on how tidy your home looks and feels. We all end up with too much stuff and it can make our homes feel so messy and disorganized. So first step in our quick solution to get you organized this Holiday is to get rid of stuff. Check out this post on how having less stuff can make you happier. Too often we fill our homes with stuff we think we need and that we hope will make us happy. It doesn’t though it ends up making us stressed. Having a cluttered environment makes us unhappy and stressed out. I bet you will be getting more things over the holiday as gifts, especially if you have kids. So now is the time to get rid of things. It doesn’t need to take long. First, go through your home and get rid of trash, magazines you don’t need, paper piles you can through, broken items, etc. Then get a box for stuff that is god condition but you no longer need. This box will be your to donate box. Find old books, clothes, toys and more that you can add to the box. You can donate them so someone who needs them can have them and you can have less stuff! Win Win! You could also choose to sell these items at a yard sale or online. Now that we’ve cleared the clutter it’s time to get down to cleaning. We need to come up with some quick solutions to get you organized for the holiday. I don’t want to give you a cleaning routine that is going to take forever you want to get the job done and be able to enjoy your nice and tidy home fast. This isn’t going to be fun unless you love cleaning. Which I don’t and that’s why I love to find ways to make it simple and get it done quickly. So grab your cleaning kit and let’s get to work. I find it easier to do one room at a time. Get that room all cleaned and ready to go and then move on to the next. I put together a checklist of what you should do in each room. The list will help you stay on track and you can cross things out as you complete them. Just click on the image below or sign up at the bottom of this post. I hope this checklist will make getting your home ready fast and easy. Phew, we made it! Now the house is clean and ready to enjoy. Let’s keep it that way, though. So we can go into the new year with some order and less stress. That’s why I wrote this post on 10 quick tips to keep you organized. When I keep up with these steps my home stays much neater and there is less work to do. If you make the time to do a little bit of cleaning every day you will manage to stay on top of it. That way the mess and disorder will not become overwhelming and a huge task. Also, make sure to include the whole family in maintaining the home. Everyone enjoys a clean home so everyone needs to help keep that way. It doesn’t have to take a lot of time or effort to keep on top of house cleaning. Just commit to 30 minutes to an hour a day. In that time I do the dishes wipe the sink and counters. Pick up the main living spaces and vacuum.Just making the time to do that regularly makes a huge difference in how my home looks and feels. It’s one of the best quick solutions to get you organized this holiday. Just maintaining the big clean up that you do. So you don’t have to do a big clean every day. Just making the time to do that regularly will make a huge difference in how your home looks and feels. It’s one of the best quick solutions to get you organized this holiday. Just maintaining the big clean up that you did. So you don’t have to do a big clean every day. Now that you’re finished I hope you can just enjoy your holiday with family and friends and that your tidy home brings you some peace and less stress. I know I always feel better in a clean house. You had me at Step one! Purging clutter is SO important any time of the year. It reduces stress and saves time. Thanks for the reminders. It definitely is a good time to get organized and to clean up the house. Yes to decluttering. Great tips! I love the feeling of being organized + clutter free! Great advice! Decluttering and keeping your home tidy is definitely a bonus this time of the year! I agree that keeping it tidy can be a chore, but the longer I work at it, the easier it is. I usually take 30-45 minutes each day to clean and tidy my home before cooking supper or relaxing. I find that I am able to quiet my mind from going over lists repeatedly with what needs to be done. So nice! Erin | A Welder’s Wife recently posted…Sharing the Good Things In Life – Photo Time! Love this! I was doing some cleaning for various reasons (company, new carpet, the holidays!!) and got rid of so much clutter and junk from my office. I now want to run into that room and just sit in the organized and clutter-free area! It makes you feel so much better!